His eyes burned as the young man tried to swallow the lump in his throat. Hands shaking, he shook the contents of the bucket into the dirty trough and blinked back tears that threatened to spill over grimy cheeks. He wiped sweaty palms on his tattered robe, attempting to dislodge some of the dirt that had gathered there. The pungent odor of livestock filled his nostrils and he sighed. He squatted on two heels and leaned back against the rough fence posts. His stomach protested loudly and he dropped the bucket into the dirt beside him. Twin tears escaped the corners of his eyes, leaving muddy tracks as they slipped over his cheeks. How had he fallen so far? Can you picture him there, broken in the dirt? The son of a wealthy man, he had never wanted for anything. His father had provided all he had ever needed and hardship was but a figment of his imagination. Security, shelter, purpose, money… All of these and more had belonged to him. But those things weren’t enough for him. Eagerly, he had requested his inheritance early. Foolishly, he had lost every last cent. And now… He was so hungry that he had contemplated stealing slop from the bucket he carried only moments earlier. He was in a deep, dark pit of his own digging…and he couldn’t see his way out. If we’re being honest with one another, every one of us can relate to his situation. We have all found ourselves alone at one point or another. To take back our harsh words. Thankfully (so thankfully! ), Jesus doesn’t write us off when we write ourselves off. We see with the eyes of man, but He sees with the eyes of the Savior. His eyes see hope in the midst of despair and beauty in ashes. Long ago, He saw a man hanging beside him. Broken, bleeding and dying, Jesus saw the criminal perfectly. His past, present and future. He saw every secret thought and every public act. Think about that for a moment. This man was literally dying. 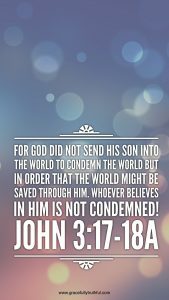 Others had already written him off – he was being crucified for his actions! He had written himself off and was resigned to the choices he had made and the sins he had committed. With his dying breaths, he confessed his life of sin and acknowledged that Jesus was the Christ. And rather than cringing and turning away, Jesus paused. Rather than ignore him, He looked directly at the man. He saw him for exactly who he was. He saw exactly what he had done…in fact, Jesus was dying for the very man he faced. But He was Jesus, perfect Love and our every Hope. Immanuel, wrapped in flesh and bone. He didn’t write the man off. Instead, He forgave him. In that glorious moment, Jesus separated the man from his sins fully and forever. Can you imagine the weight that lifted off the criminal at those few words? What peace and joy! Utter relief and hope must have flooded him…even though his physical death was at hand. Jesus wiped his slate clean. And He longs to do the same for you and me today. Like the father in the parable of the Prodigal Son, we can be certain that Jesus’s arms are open wide for us. He knows exactly what we’ve done and will do, but He loves us perfectly anyway. He willingly paid the price for our sins and He desires to extend that security to us. We have only to ask! He is waiting for us to realize that it is never too late to call on Him. 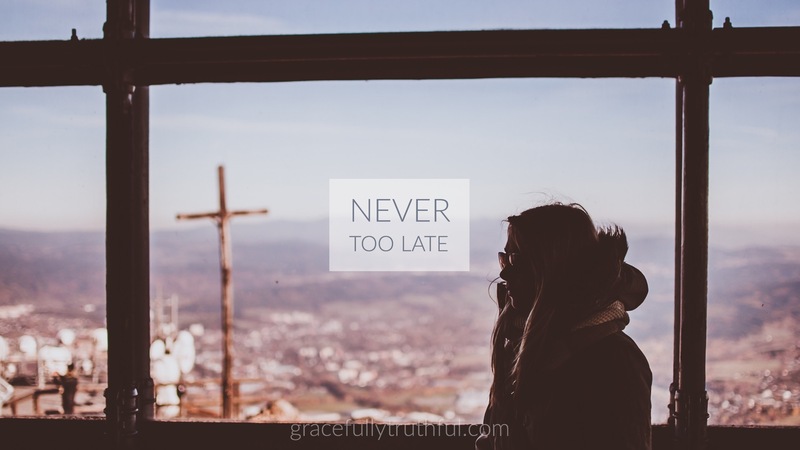 No matter how far we fall (or run), He knows our hearts and is faithful and good to forgive us. There is nothing we can do that will out-dig, out-sin, or out-run His perfect love. Not the thing that popped into your mind just now, nor the thing that danced through your memory a moment before that. NOTHING. Do you know beyond a shadow of a doubt that you have that same security in Jesus? You don’t have to write yourself off any more. There is One Who sees you and knows you, intimately. Every thought, every dream, every secret, every sin. And He loves you anyway. If you are not sure where you stand with Jesus, reach out to Him today. Confess your heart to Him. He already knows what is there, but when we confess our sins He is faithful and just to forgive us! Love, don’t wait another minute. That lump in your throat is Him calling you, friend. Exactly as you are. No matter where you’ve been. No amount of smooth writing or flowery words can replace the power of His call for you. How will you respond today? Father, thank you for never giving up on us. Help us to recognize when we are writing ourselves and others off…in any situation. Give us the clarity of mind to see that lie for what it is – a deception aimed at stealing our security in You. Fill us with your Spirit and discernment. Thanks for joining us today as we journeyed into Prodigal Week Three! Don’t miss out on the discussion below – we’d love to hear your thoughts! Looking for other journeys from this theme? Here’s a link to all past studies in Prodigal!